Suffice it to say, with Babycake's being sick for almost 2 weeks, plus me getting said sickness, I have not had a lot of alone time. The first time I was able to take a shower by myself and sleep in my own bed in 9 days (rather than on my toddler's floor), it was like sweet freedom. So when my inlaws' offered to watch Babycakes on Saturday and keep her overnight, I said yes before they had time to change their minds :) What did I do with all this me-time?! Well, first I grocery shopped alone and savored the peace and quiet; then I went on a thrift store shopping tour with some girlfriends looking for new blog photography props; then I had a lovely Indian meal with those girlfriends and we talked (without getting interrupted 8 times, heavenly!!) and laughed; then, I came home and made salmon chowder at 9pm. I'm weird, I know. But I loved every minute!! I really can't say enough good things about this soup. It is absolutely perfect. I would not change a thing. Savory. Scrumptious. 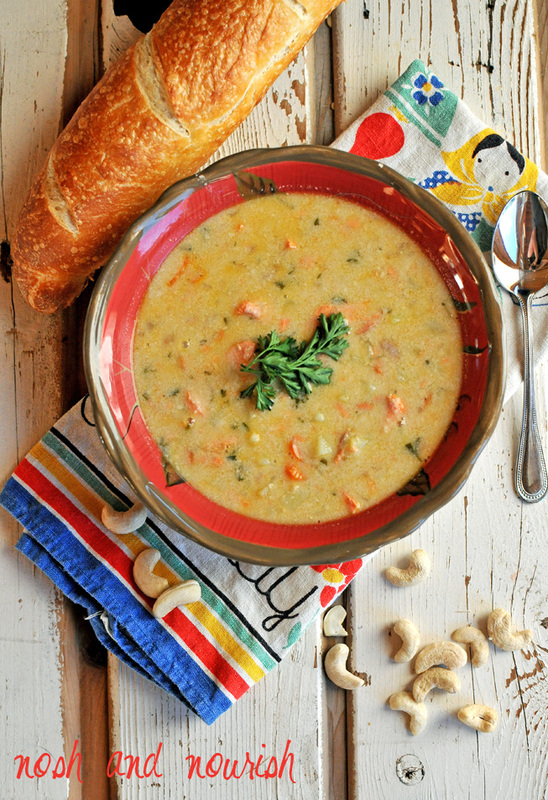 And full of nourishing ingredients -- like salmon, carrots, sweet potatoes, and cashews... This is truly a meal that your entire family will love. What's that about the cashews, you say? Well, I used what's called a "cashew cream" instead of the traditional half and half used in chowders. Basically, you soak some raw cashews in water for a couple hours, then you drain away the water. Add fresh water & puree...and it makes a lovely dairy-free cream alternative. Even if you are a dairy drinker/eater, you should give this recipe a try. Cashews are so good for you!! What do you do for me-time? 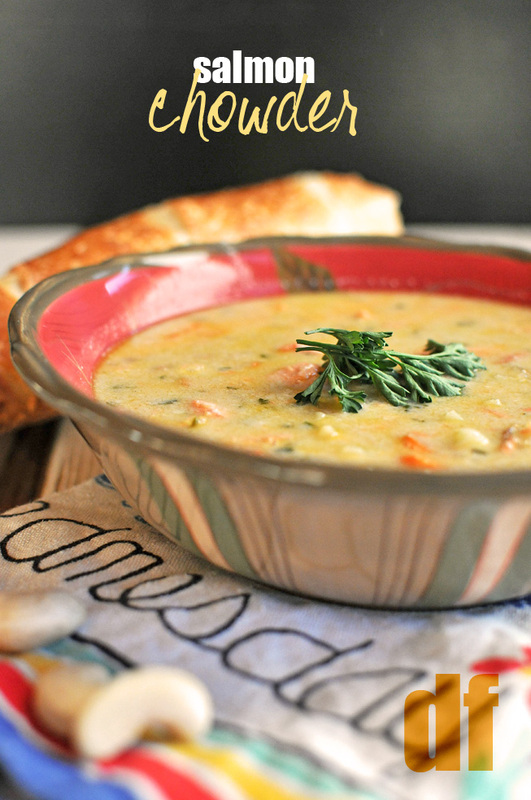 The best Salmon Chowder I've ever eaten! Ahead of time, soak your 2 cups of cashews in 1 cup of water for 3 hours. After 3 hours, drain the water out of the soaked cashews and discard. 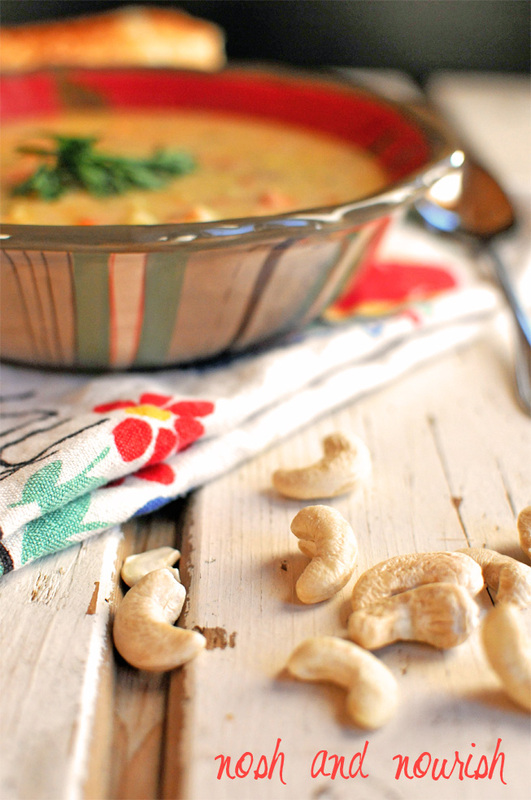 Add 1 cup of fresh water in with the soaked cashews and puree them with an immersion stick blender... then set aside. In a large stockpot, saute thinly sliced carrots, garlic, onion, and vegan butter for approximately 5 minutes, or until onion is softened and slightly browned. Add in diced sweet potato and saute for an additional 5 minutes. Potatoes should not get brown. Add in all remaining ingredients except for the salmon. Bring mixture to a boil, then reduce heat to medium to simmer for approximately 10 minutes. Potatoes should be softened. Add in thawed wild salmon. The boiling soup will cook it in about 8 minutes. Once salmon is cooked through, use a fork to flake it into small pieces. Serve with a nice french bread (optional).